Figure 1: Treatment of NIH/3T3 cells with various concentrations of LY294002 blocks PDGF-stimulated phosphorylation of Akt1 at serine 473 detected by PathScan Phospho-Akt1 (Ser473) Sandwich ELISA kit , #7160, but does not affect the level of total Akt1 protein detected by PathScan Total Akt1 Sandwich ELISA kit #7170. 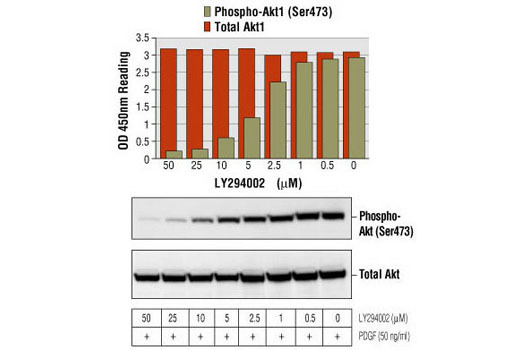 OD450 readings are shown in the top figure, while the corresponding Western blot, using Phospho-Akt (Ser473) Antibody #9271 or Akt Antibody #9272, is shown in the bottom figure. 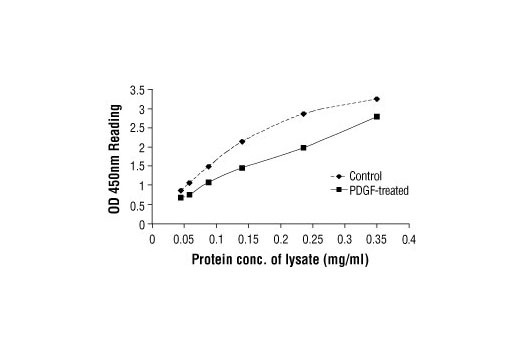 Figure 4: Linear relationship between protein concentration of lysates from either control NIH/3T3 cells (dotted line) or PDGF-treated NIH/3T3 cells (solid line) and kit assay optical density readings. Figure 3: Comparison of sensitivity between sandwich ELISA and Western blot in the detection of recombinant nonphospho-Akt1 protein, using Akt Antibody #9272. 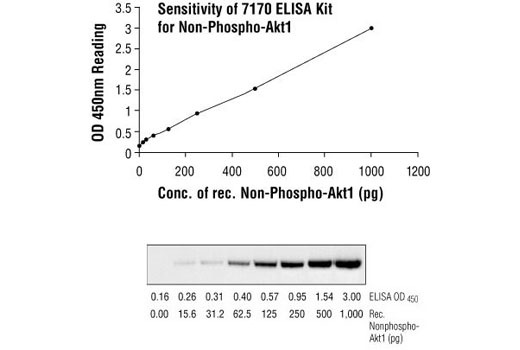 The top figure indicates that, at 0-1,000 pg of protein, the concentration of nonphospho-Akt1 is linearly proportional to the OD450 reading from the Sandwich ELISA kit. Figure 2: Comparison of sensitivity between sandwich ELISA and Western blot in the detection of recombinant phospho-Akt1 protein, using Akt Antibody #9272. 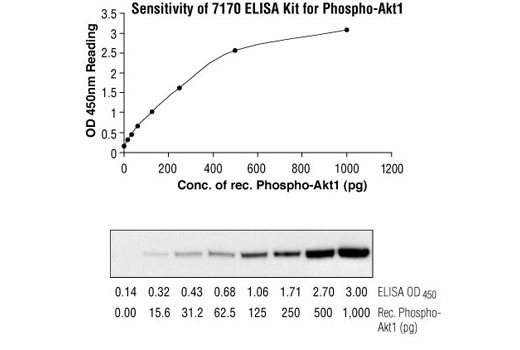 The top figure indicates that, at 0-500 pg of protein, the concentration of phospho-Akt1 is linearly proportional to the OD450 reading from the Sandwich ELISA kit. CST's PathScan® Total Akt1 Sandwich ELISA Kit is a solid phase sandwich enzyme-linked immunosorbent assay (ELISA) that detects endogenous levels of total Akt1 protein. An Akt Antibody has been coated onto the microwells. After incubation with cell lysates, the Akt protein is captured by the coated antibody. Following extensive washing, Akt1 Mouse Monoclonal Antibody is added to detect the captured total Akt1 protein. Anti-Mouse IgG, HRP-linked Antibody is then used to recognize the bound detection antibody. HRP substrate, TMB, is added to develop color. The magnitude of optical density for this developed color is proportional to the quantity of total Akt1 protein. CST's PathScan® Total Akt1 Sandwich ELISA Kit detects endogenous levels of Akt1 including phosphorylated and nonphosphorylated. Inhibition of phosphorylation of Akt at serine 473 by LY294002 in NIH/3T3 cells is detected by PathScan Phospho-Akt1 (Ser473) Sandwich ELISA kit , #7160, while the level of total Akt1 protein detected by this ELISA kit #7170 is unchanged, as seen in Figure 1. Similar results have also observed in Jurkat cells (data not shown). This ELISA kit does not detect related kinases, such as PKC and p70 S6 kinase. This kit detects proteins from the indicated species, as determined through in-house testing, but may also detect homologous proteins from other species. Harris, S.L. et al. (2005) Proc Natl Acad Sci U S A 102, 16297-302. Li, J. et al. (2015) Oncotarget 6, 1031-48.